Our Lady suffered an overwhelming grief of soul throughout Jesus’ lifetime, especially at the continual thought – and finally at the very sight – of Her Son’s terrible Passion and Death. She suffered this agony willingly for our sake, so that we might be saved. 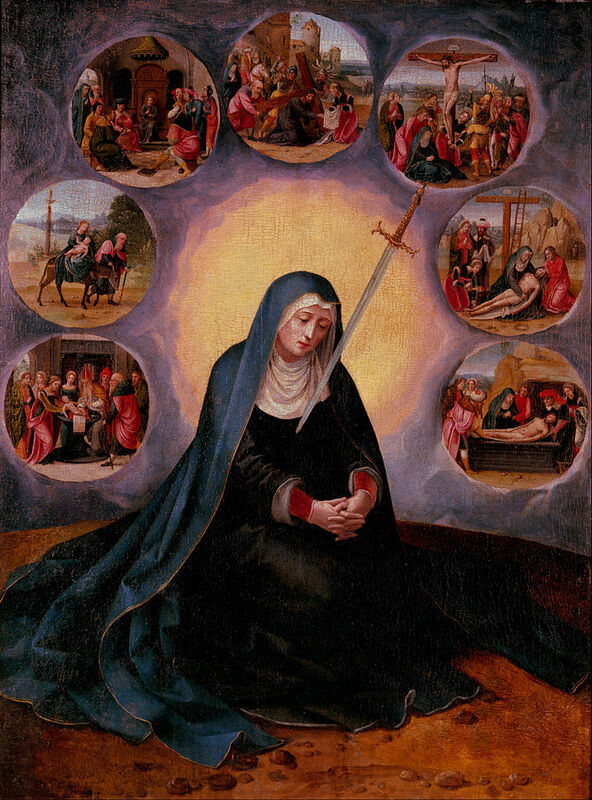 Let us show our gratitude to Mary today for enduring this life-long martyrdom, by keeping Our Sorrowful Mother in our thoughts throughout the day, and commiserating Her in each of Her Seven Sorrows! by Rev. Karl Clemens, C.SS.R. The Prophet Jeremias says: “Great as the sea is thy destruction. Who shall heal thee?” (Lam. 2:13) As the sea is all bitter and does not contain a single drop of sweet water, so the heart of Mary was filled with the bitterness of sorrow, without a single drop of consolation. Why was Her grief without comfort of any kind? Because the only source of Her consolation and comfort, Jesus Christ, had become for Her a fountain-head of the most bitter sufferings, whose waters continually overflowed into the sacred Heart of Mary. The Holy Martyrs, undoubtedly, suffered excruciating torments. But their pains were considerably lessened by the consolation with which divine love inundated their souls. They considered themselves fortunate in suffering out of love for Jesus Christ; and Jesus Christ comforted His faithful servants by filling their souls with quite special gifts of grace. But in the case of Mary it was precisely the greatness of Her love that made Her sufferings so intense. She had the fearful sufferings of Her divine Son continually before Her eyes. She would have preferred a thousand times to sacrifice Her own life for that of Her Son upon the Cross, in order to spare Him from such ill-treatment and torments; but She could not. Gladly would She have provided some refreshment, or some alleviation or diminution of His sufferings; but She could not. To suffer for the beloved is a pleasure to a heart that loves; but to be compelled to behold the beloved suffer, and not to be able to give him any relief, or assistance, is to suffer without comfort or consolation. Such was the suffering of the Blessed Virgin. She did indeed receive from Her divine Son the special grace not to succumb under the weight of Her grief; but She received no comfort, no consolation, just as He Himself experienced no alleviation of His sufferings. And these sufferings had lasted for Mary a very long time. 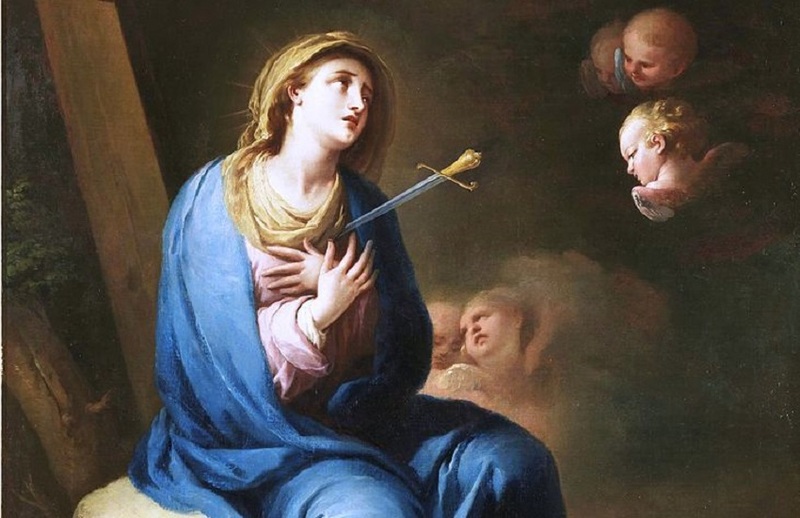 Since the prophecy of Simeon: “And thy own soul a sword shall pierce,” (Luke 2:35) Mary had the frightful torments of Jesus constantly before Her eyes. When He was crucified She not only witnessed all His sufferings, but She also felt them in Her very heart. From that time on until Her blessed death, the sufferings of Jesus remained deeply engraved upon Her heart, and She could no longer find any real joy in life in this miserable world. Only when reunited eternally in Heaven with Her dear Son did the time for joy and exaltation begin for Her. Such a love as Mary’s for us deserves our most heartfelt gratitude. And this gratitude consists principally in two things: that we detest sin with our whole heart, and that we cultivate a most tender devotion for the sufferings of our sorrowful Mother. Christian soul, take these words as if they were addressed to yourself. If you see others lukewarm or negligent in the practice of this devotion, do not allow yourself to be influenced by their example. On the contrary, endeavor by the good example of your fervor and zeal to induce others to faithfully cultivate devotion to the Sorrows of our dear Mother Mary. St. Alphonsus, quoting Pelbart, recounts a revelation made to St. John the Evangelist, which is well calculated to inspire all with a love for this devotion. Our Blessed Lady appeared to him, and with Her Jesus Christ also appeared; the saint then heard Mary ask Her Son to grant some special grace to all those who are devoted to Her Sorrows. Jesus promised Her four principal ones: first, that those who before death invoked the divine Mother in the name of Her sorrows should obtain true repentance of all their sins; second, that He would protect all who have this devotion in their tribulations, and that He would protect them especially at the hour of death; third, that He would impress upon their minds the remembrance of His Passion, and that they should have their reward for it in Heaven; fourth, that He would commit such devout clients to the hands of Mary, with the power to dispose of them in whatever manner She might please, and to obtain for them all the graces that She might desire. The love of Jesus is a balsam that heals all wounds. The love of Jesus is a heavenly wine from the divine Vine. This wine strengthens the heart, and fills the mind with heavenly gladness. This is what the holy Apostles, the holy Martyrs, Confessors, and Virgins, have all experienced. In the midst of their great tribulations they have been filled with a sweet peace and consolation. And today all truly pious Christians have the same experience. If they are visited with long and severe sufferings, they receive the Sacraments, they go to Confession and Holy Communion the more frequently. They visit the Blessed Sacrament all the more, and pour out before their Hidden Lord in the Tabernacle their oppressed heart. They make novenas and meditations, and have Holy Masses said. And Jesus, who sees the faith, the confidence, and the love of His much-tried children, comforts them in all their trials. If, then, you are visited by sufferings or trials, Christian soul, imitate not the children of the world, but follow rather the example of the children of God. Then you will not feel that you are forsaken and abandoned in your tribulations; but you will enjoy a true, interior peace. To Thee, then, will I have recourse in all my anxieties and temptations, in all sickness and other trials of life. I have, it is true, the good will, the resolution to do so; but I still lack the accomplishing, the grace to carry these resolutions into effect. Of what use to me would it be to have this good will now, if later I were to forget to call upon Thee in the time of danger? O my amiable Mother Mary, it is Thy bitter sorrows that show me clearly the greatness of Thy love for Jesus and for me. It is these sorrows of Thine that inspire me with an unbounded confidence of obtaining from Thee all that so good, so merciful, and at the same time so powerful a Mother as Thou art can give me: light in darkness, comfort in anxiety, protection in danger, counsel in doubts, fidelity and perseverance in the pursuit of virtue and in preserving my soul in grace, powerful assistance in the hour of death, and a merciful advocate in judgment. Assist me, therefore, in all my needs, now and at all times, but especially at the hour of my death, O clement, O pious, O sweet Virgin Mary! Amen.